Supplied with a Ø180mm wool bonnet buff and backing pad. The polisher is a power tool used in the finishing process, used with polishing buffs and compound sponges to yield a dramatic difference on a painted surface. The objective of polishing is to remove imperfections in the clear-coat that cause the paint to look dull. Surface imperfections can include swirls, scratches, water spots, etchings, industrial fallout, oxidation, etc. Professionally manufactured for the automotive paint care and detailing industries. Ergonomically designed to reduce fatigue in long term use. 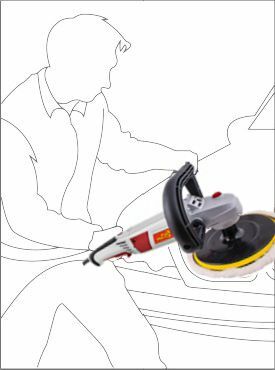 The polisher has various hand-held positions to better hold the polisher at angles. Gear system has a two-level deduction. With two times the amount of torque than a single gear set polisher. 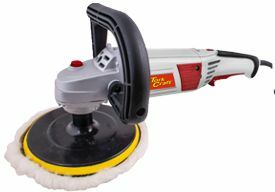 The Tork Craft polisher features a built-in variable speed control. It is advisable to use the polisher on it's lowest speed to prevent friction. Lift the polisher often away from the panel (under no-load) to allow the motor to cool down.